There is a lot in this small town. Marty and I look at a preserved and still used fishing village. The boat is lat 1800’s. The first night in Traverse City I noticed that while good weather was coming the next day, winds would be coming up for some time after that. The predicted wave heights would also come up. I didn’t like being 30 miles down in a bay so far away from the main lake. If I were to leave and conditions were too bad to go on, I wouldn’t know about it first hand until we had travelled three hours and were somewhat committed to continuing. Since the next day was to be good, we all decided that getting out and around the point to Leland was the best option. The nearest other refuges are here in Traverse Bay and 40 miles south of Leland at Frankfort. Later in the season and a bit further south both caused daylight to come a little later. Six fifteen was our new early leaving time. 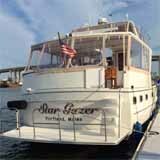 We were out of the bay by 9:30 and got to Leland easily before noon with very little rough stuff. A boat in a preserved rescue station. 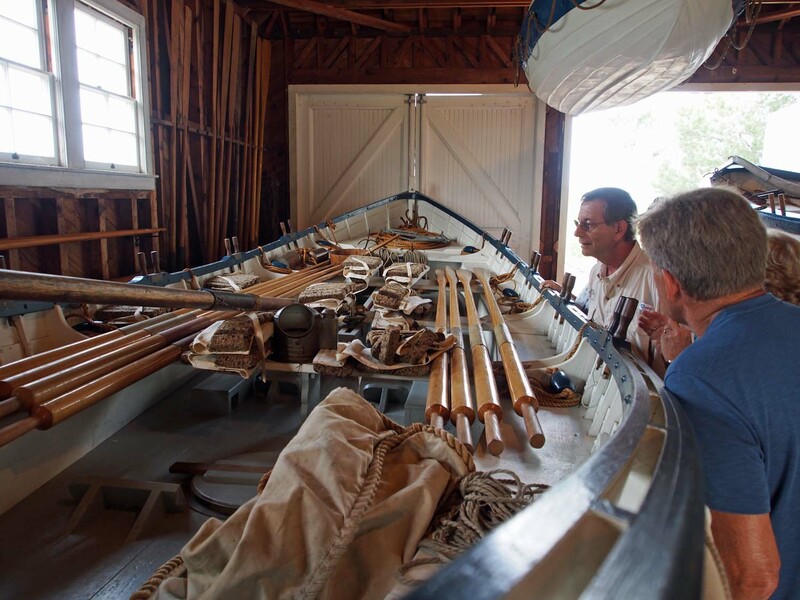 We saw demonstrations and equipment they used at the turn of the century. 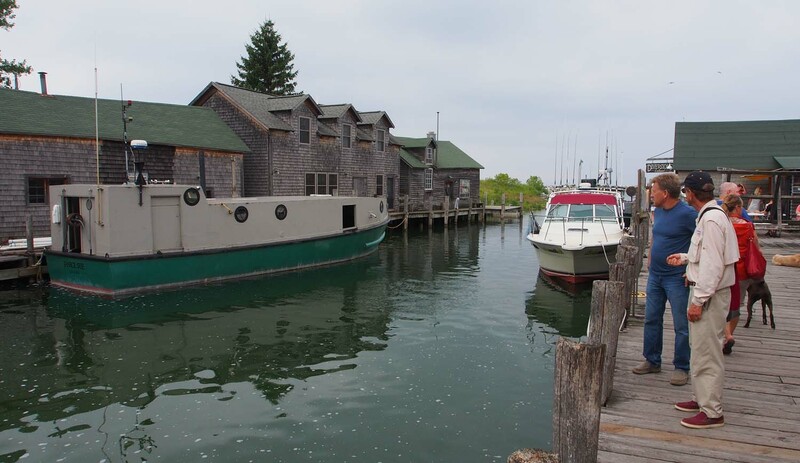 Leland is very small, but has an interesting preserved and still used fishing village next to the marina. Except for the small stream where the few fishing boats have always parked there is no natural harbor, so breakwaters were built with big rocks to form a harbor of refuge. We all came in early and Marty and Cheryl had their van, so we soon headed for the Sleeping Bear sand dunes. 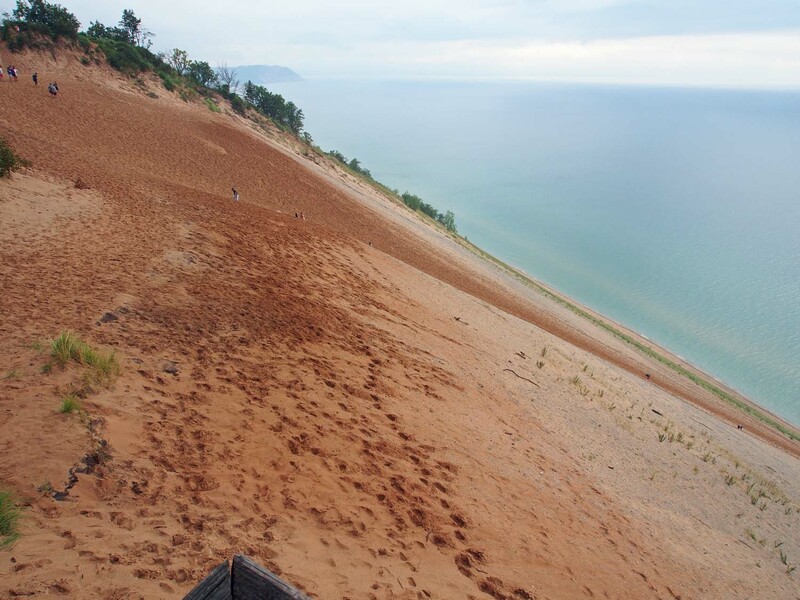 These dunes at 450 feet above the lake level are some of the highest hills in Michigan. The slope steeply and very straight from their top down to Lake Michigan. It’s hard to believe sand can hold a slope that steep. Sleeping Bear dunes. The vertical drop from here to the lake is 450 feet. Its all just a pile of sand. Leland is a nice town to be stuck in. We may be here awhile.